Wish I could be back for the real thing! With extra time to fill in due to the cancellation of yet another horse trial event (Chatsworth) in England, a visit to Greenwich seemed like a good idea on what was finally a fine day (ironically). Greenwich is a lovely village at the best of times. There’s an interesting covered market selling everything from children’s toys to clothing and food. Weekends around lunchtime isn’t the best time to visit this market, however, especially if you don’t enjoy such a crush of people. There’s also some great traditional pubs, some cute shops and a number of historical buildings to visit. The Maritime Museum is worth a look, and it is compulsory to go up to the Royal Observatory and see the Prime Meridian which is the basis of longitude (for a small fee of course). While the Maritime Museum will stay open, the Observatory, as well as some of the other sights including the Queens House, will be closed for some time over the Olympic period. The prime reason for my visit this time, besides having the opportunity to check out a couple more lovely English pubs, was to see where the Olympics will be held, and have a look at what progress was being made. As I won’t be attending the Olympics, being able to visit to get a good idea of the layout was the next best thing. I was expecting to see a hive of industry, with workmen swarming all over the place building things, or levelling arenas or something. View from up the hill towards the Observatory. We did manage to find four workmen who looked as if they were doing something constructive, (and took a photo of them) and saw about another 10 people in high-viz jackets, who were obviously having a tour of the construction zone. Perhaps the work stops on the weekend to enable the public to enjoy the beautiful park, who knows. I did attempt to ask one official looking fellow, who promptly told me off for taking photos (in a strong South African accent). However, the friendly Polish fellow who was on security called us over to him after the other fellow stalked off to do something important. He showed us where to get a good photo and had a bit of a laugh with us, but knew nothing about what was happening, except it was for the horses at the Olympics. Nice fellow. We joined the many others heading up the hill towards the Observatory where there really are the most fantastic views back to the City. It’s a great spot to take photos, and you get a good view of the arena and where the practice arenas will be. There was a lot of interest in the project, with lots of people talking positively of it. We didn’t hear anyone commenting negatively. The whole construction is being handled very carefully, with lots of information and signage out explaining what is happening. There is absolutely no signs of any cross country that we could see. We did find out that the stables will be up the Blackheath end of the park but that the construction of these wasn’t due to start until early June. Kirsty and the helpful Polish workman. We had a bit of a walk around the park where the cross country will be held, although we were not exactly sure on the path that will be taken. There are a lot of trees, many with very low canopies, and the terrain is very up and down, hills everywhere. While I have no real ideas of where the cross country will go, I’m not sure how much the spectators will get to see of any one horse making progress around the course, but there are always the large screens which I’m sure will be placed at various strategic places around the park. TV viewing will be spectacular, especially as the cameras pan down to the views back towards London and over the Greenwich village area itself. The actual arena is right behind the Maritime Museum and the Queen’s House on what is called “The Queen’s Field.” The map can be found here. There was a lot of scaffolding for the main stands, which will seat 20,500 people. 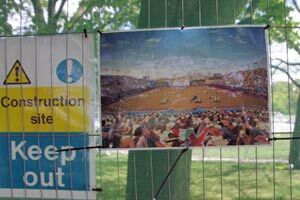 It was easy to visualise how exciting it will be for those lucky enough to have tickets to the various equestrian events that will be held there. That’s the 02 arena in the background (looks like large toothpicks sticking out of it). You can see how close the practice area is going to be to the herb garden – just behind that green fence. That’s the main Olympic stadium in the background (with the white framework) and the twirly crane thing is also part of the Olympic buildings. The view from beside the Observatory, with the Equestrian stadium just below. The only real activity seemed to be a tour of the stadium by some fluro-vested officials. A picture showing what it will eventually look like. The equestrian stadium is behind this lot of buildings including the Maritime Museum.